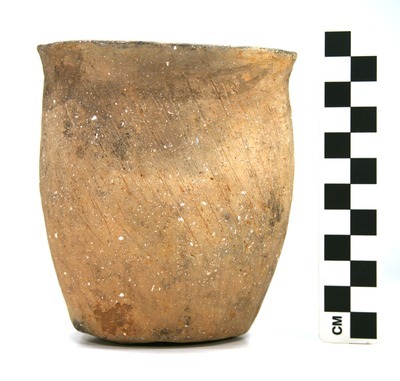 "41UR315, Burial 22, Vessel 103" by Timothy K. Perttula and Robert Z. Selden Jr.
DECORATION (INCLUDING MOTIF AND ELEMENTS WHEN APPARENT): There is horizontal brushing on the rim, and diagonal brushing on the vessel body. The lower 30 m of the vessel is plain and smoothed. Bullard Brushed jar, Vessel 103, Burial 22.